Most interior doors are prepped with a single boor hole. The Bore hole is the large diameter hole where the door knob is mounted. The standard sized bore hole is 2 1/8" in diameter. Through the edge of the door there is a 1" cross bore that extends from the edge of the door through the bore hole. This cross bore is where the latch is installed. In addition to the two cross bores, a door can be prepped for one of 3 different types of latches. Drive-in latches are the easiest to install. 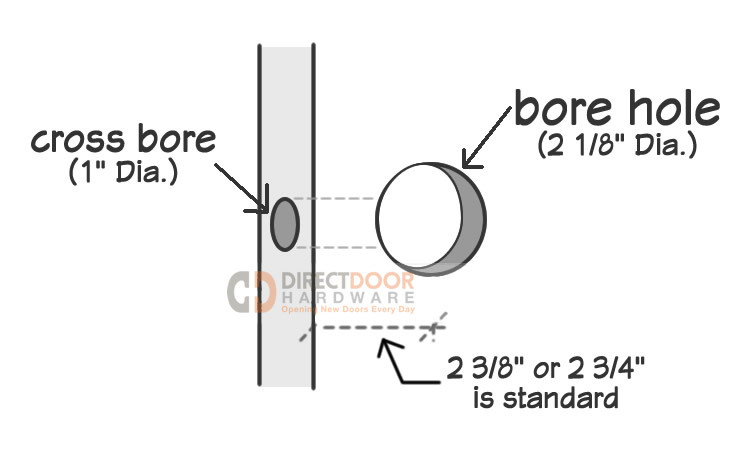 A door prepped for a drive in latch has only a 1" cross bore on the edge of the door like the image to the left. Do install the latch, all you have to do is slide it into the cross bore and tap it into place gently with a mallet or hammer. Drive in latches have a ribbed collar around the top so that when the latch is driven into the door the ridges hold it securely. Rounded corner faceplate latches are very common. The faceplates give the latch a quality look and hold the latch securely in the door. These faceplates are 2 1/4" in height and 1" wide with about an 1/8" radius on the corners. Many door shops will use a router jig to prep the door for you so that all you have to do is install the latch. If your doors are not prepped this way, but you want a faceplate, we recommend purchasing locks with square corner faceplates below as it is much easier to chisel out square corners than rounded. Square corner faceplates are the same size as the rounded corner, they just have square corners. If you want faceplates, but your door is prepped for drive in latches you can easily prep your door for these using a 1" chisel. Just mark the area 1" wide and 2 1/4" tall centered on the cross bore and chisel out about 1/8" depth of material. These square corner faceplates give your door a refined clean look. If your doors are prepped for radius corner faceplates, but you prefer square - just chisel out the very corner, super easy to do. 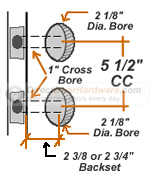 Standard door preparation for a door with both a door knob and a deadbolt have two sets of bore holes and cross bores stacked on top of each other at 5 1/2" from center to center (like the diagram shown on the left) It should have the exact preparation for the deadbolt, as the knob below with a 2 1/8" diameter bore hole and 1" cross bore. Deadbolts generally do not have a drive in latch, so these doors would usually be prepped for either a rounded corner or square corner faceplate latch. Some doors are prepped for a knob with a drive in latch, while the deadbolt hole is prepped for a faceplate. While this works and is easier to install, it just looks nicer if you prep the door for matching latches. We actually recommend on exterior doors that you use a latch with an attached faceplate as they seem to hold up better to the high use exterior doors generally have. Is your door prepped for door hardware that won't fit the standard door preparation as we have described here? Please give us a call 877-852-9449 and we'll help you find what you need.